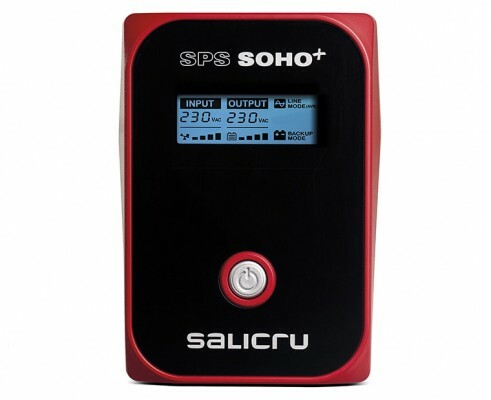 SALICRUâ€™s SPS SOHO+ series is a line-interactive UPS that incorporates an automatic voltage regulator (AVR), which attenuates all possible fluctuations in the input voltage and at the same time causes smaller use of the batteries, extending their life and assuring maximum autonomy if necessary. For better integration in the office computer environment, the SPS SOHO+ series equipment has a full, rear-lit LCD display that gives all information of the operating state of the units. It also has complete monitoring and management software through the USB communication port, which enables continuous control of the system status and allows controlled computer shutdown in the event of a long blackout when the system is left unattended. Other outstanding functions include the Cold Start, which allows the system to be started in the absence of mains power; automatic self test performed on the unit every time it is started, and the incorporation of schuko type socket to allow any kind of load to be connected.